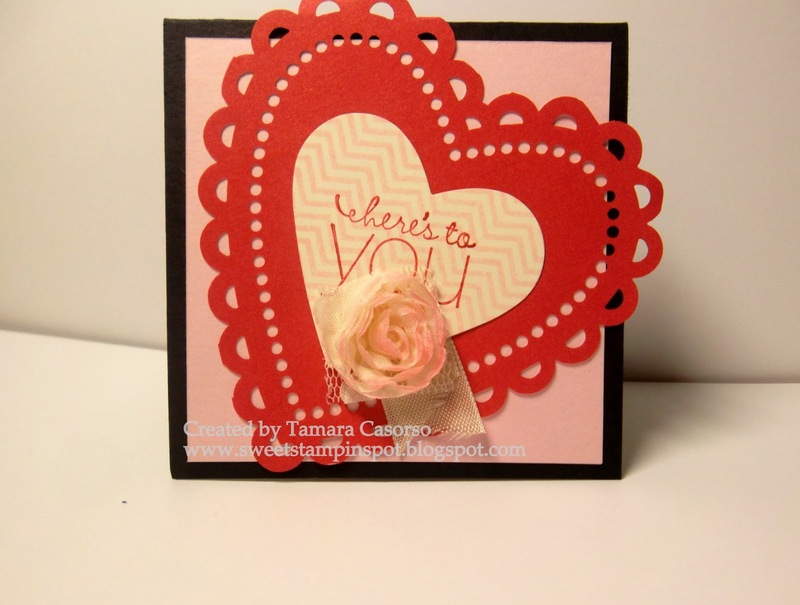 Sweet Stampin' Spot: Here's to You! Here's to YOU, my friends and customers! I appreciate you all so much! You're what allows me to keep doing what I love: Creating & Sharing! It's just a 3x6 piece of Basic Black cardstock folded in half thus becoming a 3x3 card. Layered on top is a 2 3/4" square of Pretty In Pink with a red scallop heart from the cute valentine's DSP in the still current mini catalgoue - More Amore specialty designer series paper. 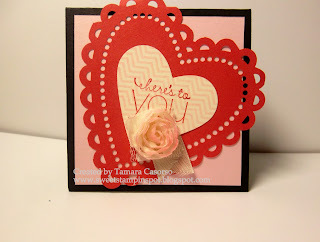 After that, I stamped a piece of Very Vanilla card stock with the chevron oval stamp from Oh, Hello. I punced it out using the large heart punch and stamped here's to You in Real Red. (Here's to You is from Friendly Phrases). Vanilla seam binding ribbon is peeking out from behind a single flower from the Vanilla Flower Trim (spring mini catalogue). 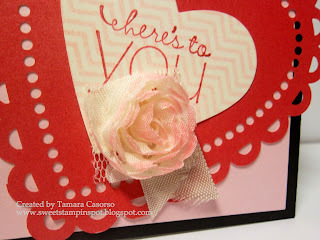 I used a Pretty in Pink stampin' write marker to just add a smidge of colour to the edges of the rose. So sweet and simple. These were so quick to whip up a bunch, but still have some extra touches to make it special. Pretty in Pink will be retiring at the end of May so be sure to stock up on card stock and reinkers if it's one of those colours you just can't do without!